Believe it or not, yesterday morning, Howard and I discussed roasting squash and making a salad for dinner. We have 25 pounds of butternut squash from the CSA. 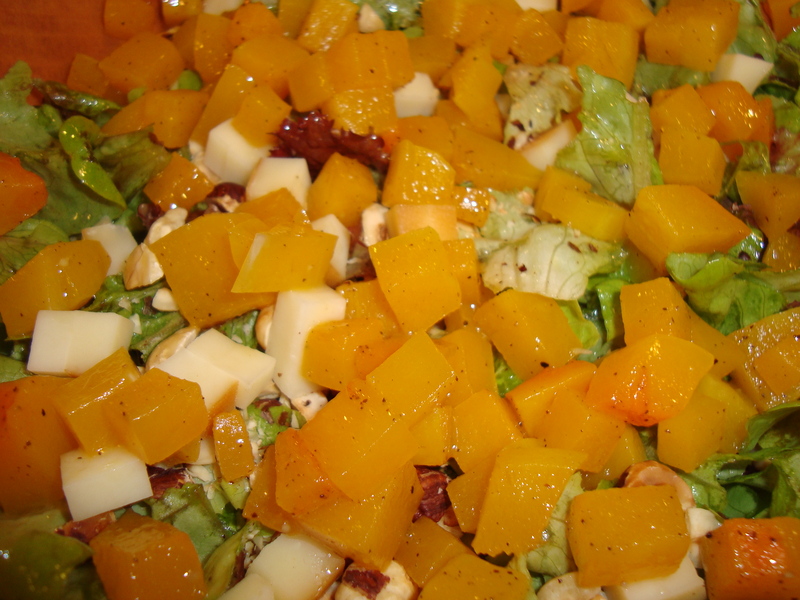 Coincidentally, during the day, my friend Lauren sent me the link to this recipe for Roasted Squash and Hazelnut Salad. I didn’t follow the recipe exactly because I didn’t have all the ingredients called for, but it served as a good inspiration and came out well. I roasted butternut squash, cut into ½ inch pieces, instead of acorn squash cut in crescents. I didn’t have any goat cheese, but I did have Smith’s smoked gouda, a local cheese I’m a big fan of. Also, we had two kinds of lettuce from our final CSA share from last week, so I used that instead of arugula. I did have hazelnuts, extra virgin olive oil and good balsamic vinegar. Lauren, thanks for the recipe tip. It was a winner!